Jimmy Giuffre (clarinet, tenor and baritone sax) Jim Hall (guitar) with Ralph Peña, Jim Atlas, Red Mitchell, Ray Brown or Wilfred Middlebrooks (bass) or Bob Brookmeyer (valve trombone and piano). Recorded in Los Angeles, New York, Lenox and Chicago between 1956 and 1959. 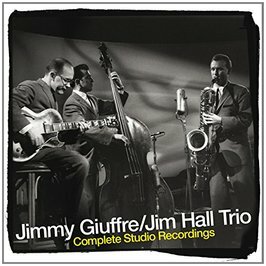 For anyone who hasn’t heard Jimmy Giuffre’s pre- sixties trio music this four CD set offers an easy way to acquire it rather than having to search out individual discs, some of which may have become hard to find. On the other hand veteran collectors will need to check the track listing carefully to avoid duplications. This latest re-issue format comprises four of his Atlantic sessions, namely `The Jimmy Giuffre 3`, `Trav’lin Light`, (including the initially rejected tracks from a prior version) `The Four Brothers Sound` and `Western Suite`. Two Verve sessions, `7 Pieces` and `The Easy Way` are also included plus some bits and pieces from TV broadcasts of the period and, oddly enough, a single live club performance. It was Giuffre’s blues based folk oriented jazz featured in these recordings rather than his big band work with Woody Herman that first claimed my attention and I still delight in playing my DVD of `Jazz on a Summer’s Day` in which the bobbing sound of ` The Train and the River` - his greatest hit after `Four Brothers` - provides the perfect soundtrack to Bert Stern’s evocative photography in the opening credits. We get three versions of that famous mini tone poem here but not the sound track version with Bob Brookmeyer on valve trombone instead of the bass. You’ll need to search out `The Jimmy Giuffre 3, Hollywood and Newport 1957 -1958` (FSCD- 1026) if you want that. It remains the most successful realisation of his drummer less concept with the rhythmic momentum and melodic substance being shared in an interchangeable fashion between the three instruments and the tonal colour enhanced by the employment Giuffre’s three instruments within the single piece: complex but thrilling and accessible, a chugging ostinato theme representing the train contrasted with a flowing, legato passage representing the river. Originally inspired by the delicacy of Debussy’s impressionistic chamber music and wishing to liberate his music from the insistence of drum kit rhythms Giuffre wrought a quiet revolution with compositions of this type and even today they have the capacity to sound startlingly fresh and original whilst at the same time clinging to nostalgic yearnings that lie at the very roots of American musical traditions. With `Trav’lin Light` Giuffre replaced the bass with Brookmeyer’s trombone which as well as upping the volume, strengthened the melodic and improvisational interplay. Both Hall and Giuffre had previously worked with Brookmeyer on the trombonist’s earlier `Traditionalism Re-Visited`, a not dissimilar but somewhat more robust project. The change in emphasis moved Hall into a slightly more rhythmic role but didn’t diminish his importance in the articulation of melodic line and if anything increased his use of bluesy licks. This new gutsier format achieved its apogee with the `Western Suite`, another highly evocative tone poem which celebrates the sounds and images of the old west, mixing in some blues and jazz attitude. Finally, I haven’t said much about Jim Hall which might be regarded as an omission. He is of course superb and his contribution absolutely essential to realisation of Giuffre’s `down home` concept but it was Giuffre’s music and the group was the Jimmy Giuffre 3 not the Jimmy Giuffre / Jim Hall Trio as billed here.